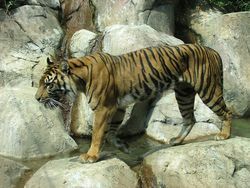 The Sumatran tiger's scientific name is Panthera tigris sumatrae. It is also they need living the largest land. ↑ Sumatran tiger ZOO ATLANTA. Web. 28 December, 2016. Unknown author. ↑ Sumatran tiger Smithsonian's national zoo & conservation biology institute. Web. 1 January, 2017. Unknown author. ↑ Reproduction and Life-Cycle Project Sumatran Tiger. Web. 1 January, 2017. Unknown author. ↑ sumatran tiger rainforest alliance. Web. 30 December, 2016. Unknown author. This page was last modified on 11 February 2017, at 17:22.